Although Nokia seems more focused on naming its devices with Lumia and then some numbers, who says that they won’t change this pattern once the Lumias start selling less well? 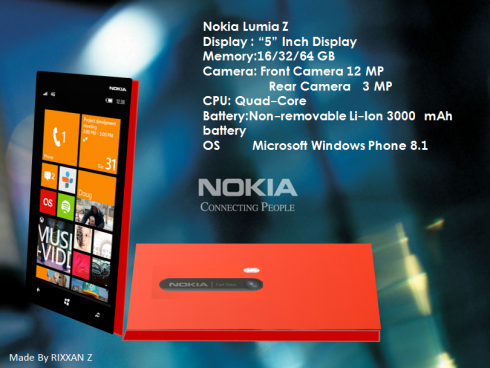 Well, we have a fresh concept based on that idea, one that’s dubbed Nokia Lumia Z and it was designed by Rixxan Z. This phone packs a 5 inch display and comes with 16, 32 or 64 GB of storage, a front 3 megapixel camera and a rear 12 megapixel shooter, although the image here has them the wrong way, obviously. Inside the handset there’s a quad core CPU and other specs include a non removable Li-Ion 3000 mAh battery, as well as Windows Phone 8.1 as the OS. The device’s design is all squared up and it looks basically like a thinner brick, which is not exactly my cup of tea. I’d see this model as a Lumia 6xx series or maybe 7xx. Also, I think that the battery inside is a bit big by today’s Windows Phone standards.